Radiation effects in microelectronics, radiation hard design methodologies and physics of failure of compound semiconductors in space applications. Materials degradation, radiation induced defects in metals, corrosion and high pressure induced transformations in steels and iron alloys. T.J. Anderson, K.D. Hobart, J.D. Greenlee, D.I. Shahin, A.D. Koehler, E.A. Imhoff, R.L. Myers-Ward, A. Christou, F.J. Kub, “UV and EUV Detectors Based on the Graphene/SiC Heterojunction”, Submitted to Electronic Letters, 2014. Kaushik Chatterjee, Mohammad Modarres and Joseph B. Bernstein. "Fifty Years of Physics of Failure" (PDF), Journal of the Reliability Informaiton Analysis Center, January 2012. Martin Peckerar, Thomas Martin, and Aris Christou. 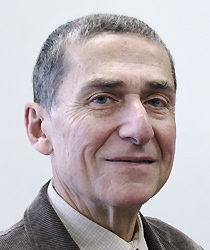 http://christou.umd.edu/publications/conferences.html"Nanoparticle Technology for Power Integration With Flexible Substrates." S. J. Chang, C. F. Shen, S. C. Shei, C. S. Chang, W. S. Chen, T. K. Ko, J.K.Shei and Y. S. Sun, "Highly Reliable Nitride-Based LEDs with Internal ESD Protection Diodes" (PDF), IEEE Transactions on Device and Materials Reliability, November 2005. Christou presented on the performance and reliability issues of GaN devices. Shahin’s presentation at the MRS Fall 2017 Meeting took second place. David Shahin and Aris Christou collaborate with U.S. Naval Research Lab on high-electron-mobility transistors. NREIP Program selects MSE grad student for summer program. Professor will present paper on predictive modeling of grid reliability. Bailey receives second SEEDS Fellowship, will conduct work in Leite Lab. Clark School professors support the State of Maryland's efforts to establish a resilient wind farm. Md. Higher Education Commission funds Clark School study of reliability, cost-effectiveness of wind-generated energy. Professor will be featured speaker in summer conferences in Greece. Professor recognized for pioneering work on high-impact journal. Participants from academia, government and industry discuss manufacturing initiative, new consortium to address challenges. Event to be held Oct. 23 at Kim Engineering Building. Professor will also be recognized for contributions to semiconductor research. New program will fund research in Greece. Professor discusses rise of applicants to nuclear engineering programs. Ankem, Christou, and Moderres to create new modules for nuclear, reliability, and sustainability engineering programs. Nuclear Engineering graduate degrees (M.Eng. and Graduate Certificate) available 100% online. New lasers are tunable, span longer wavelengths. International society recognizes original research, leadership. Sessions seek to improve K-12 education, inspire students.